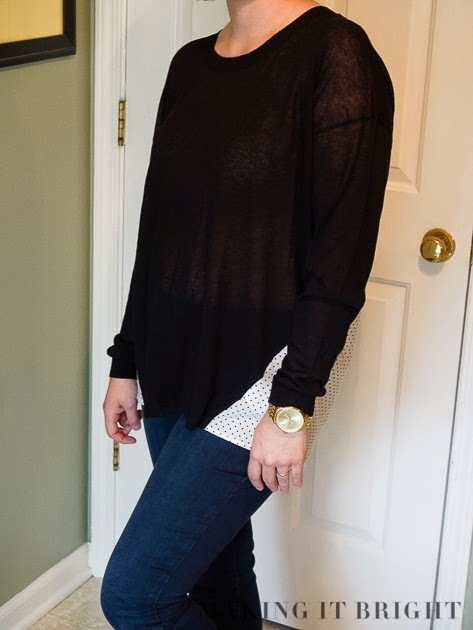 My latest Stitch Fix arrived on Friday. I requested a fix for fall and specifically requested jeans. I've done one previous fix-- in April-- and then I specifically requested items for our Vegas trip and date nights. In that fix, I got a shirt, a leopard cardigan, two dresses, and a pair of cropped jeans. Kept it all. 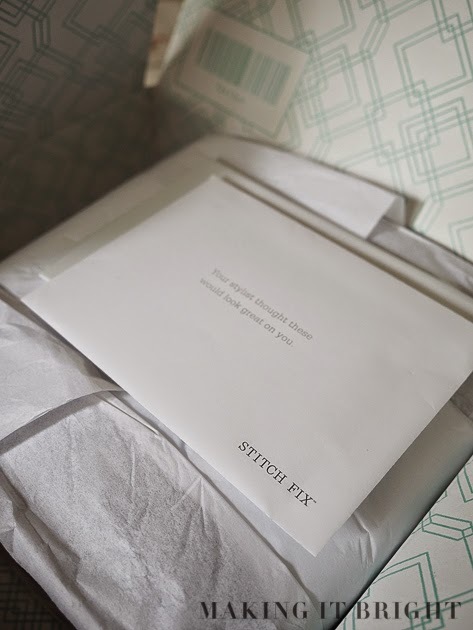 If you don't know much about Stitch Fix, it's amazing! You fill out a style profile (measurements, colors/materials you absolutely won't wear, price ranges) so that your stylist can better select pieces for you. You select groups of outfits that you like best so they have a better feel for your tastes and you can also link a Pinterest board to your account. You can specifically request items (like jeans or a dress for a wedding). The styling fee is $20 and is applied to whatever you choose to keep from your fix. They send you a box with your items and you have three days to return items in a prepaid USPS mailer. When you checkout on your account, you can leave feedback for your stylist regarding each piece and the fit. On to this fix. I must admit that I cheated and peaked at my Stitch Fix account when I got the shipment email to see what the pieces looked like. 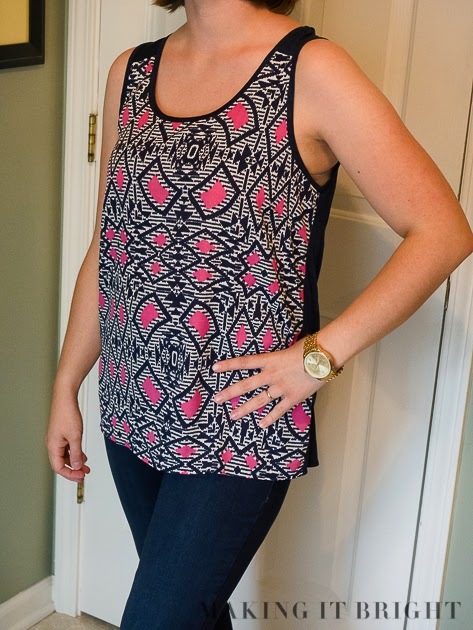 Priya Abstract Print Knit-Back Tank in Navy from Pixley. This is one of my favorite pieces from this fix. I love the colors and it is so comfortable. A little big on the arm holes but I thought I'd just wear a navy bra-- problem solved. I'll pair it with a nice cardigan for cooler days and it will be a great pop of color. Breyson Split-Neck Tab-Sleeve Knit Top from Market and Spruce. 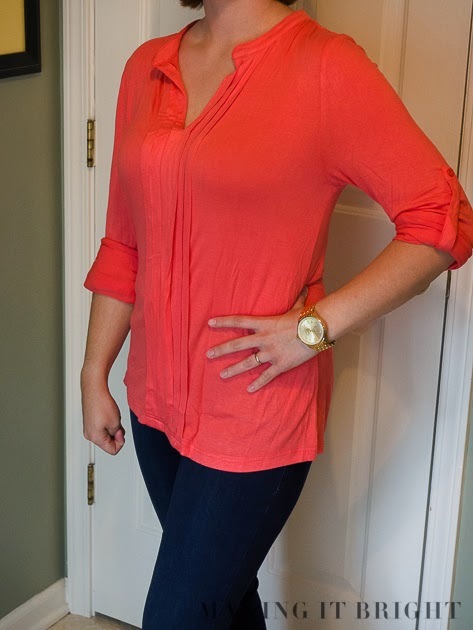 LOVE the coral color and the fit! It is so soft and hangs nicely. Flattering and colorful. 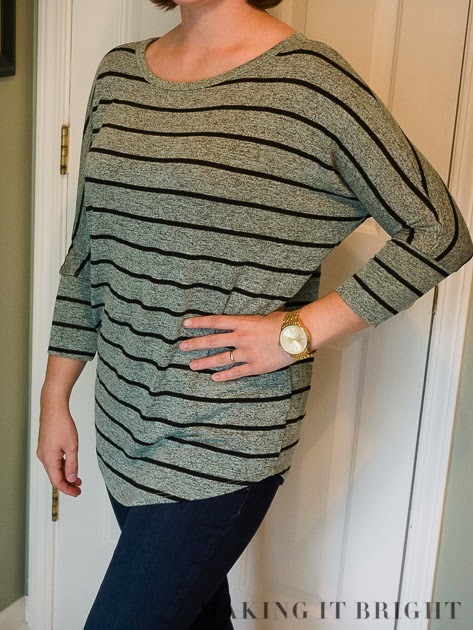 Corinna Striped Dolman Top in Light Green from Market and Spruce. When I first saw it in the box, I was "meh", but once I put it on, I loved it. Super comfortable. The jeans in all of the photos above are the ones from this fix, Freida Skinny Jeans from Mavi. High waistline for holding in that extra bit of mommy fluff. Super skinny but not uncomfortable. They almost feel like thicker yoga pants-- tight but stretchy. And socially accepted in public. I have really been pleased with Stitch Fix. If you'd like to try it, use my referral link so I can get some more discounted clothes. New clothes that fit make me a happy gal!